Sumptuous mansions, extravagant parties, lavish outfits and exotic cars – these are some of the scenes portrayed by F. Scott Fitzgerald in his book, The Great Gatsby, about the Gold Coast of Long Island during the Roaring ’20s. Inspired by visits to Long Island, Fitzgerald’s book takes place in an era when wealthy New Yorkers, seeking a more bucolic retreat from their urban lives, built opulent estates on the north shore of Long Island. Of the grand mansions of that era that remain today, many have been demolished but many others have been re-purposed and renovated, functioning as venues for special events and weddings. Others have been converted into educational centers and museums. Oheka Castle, also called the Otto Kahn Estate, was built during the 1910s by philanthropist and investment financier Otto Hermann Kahn. Situated on the highest point in Long Island in Cold Spring Harbor, the estate is the second largest private home in the United States boasting 127 rooms and over 109,000 square feet. The estate also features an 18-hole golf course, one of the largest private greenhouse complexes in America, and a sprawling French Formal Garden in the front of the house. 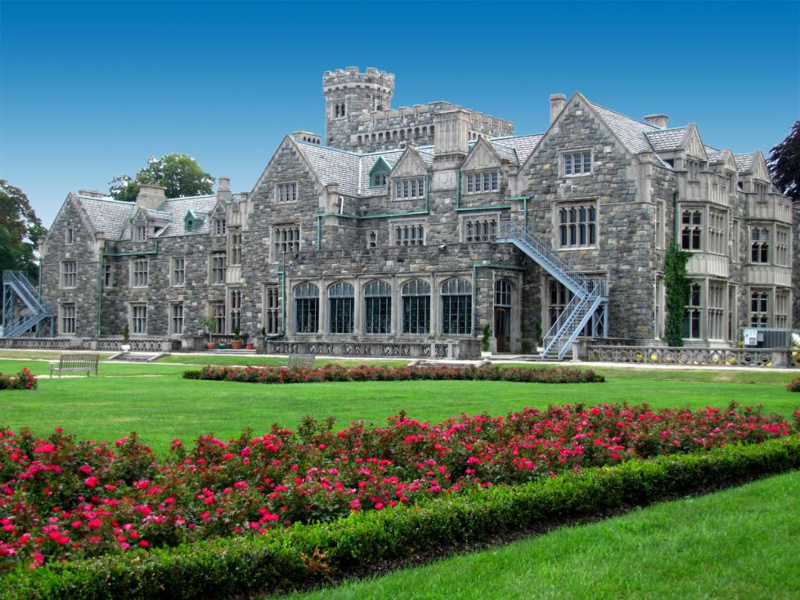 During the heydays of the Gold Coast of Long Island during the 1920s, Kahn used the lavish estate to host extravagant parties, and entertain royalty, heads of state, and Hollywood stars. After Kahn’s death in 1934, the estate changed hands multiple times, and was utilized for various purposes, including a retreat for New York City Sanitation workers. From 1948 to 1979, the Eastern Military Academy used the school. However, after the closing of the school in 1979, the building remained dormant for four years, during which over 100 documented arson attempts occurred and the mansion deteriorated to a state of complete dilapidation. In 1984, Long Island developer Gary Melius purchased Oheka and commenced the largest private residential renovation project in the United States, even striving to recreate the gardens from the original drawings. However, after ten years Melius was unable to fund the exorbitant renovation process and he ultimately sold the estate to Hideki Yokoi. Interestingly, after ten years, and a lawsuit, Oheka Castle returned to Melius who operates it as a weddings and events venue, luxury hotel and conference center. Oheka Castle exemplifies the estates of the Jazz Age, also known as the roaring 20’s, and is said to have served as partial inspiration for Gatsby’s estate in F. Scott Fitzgerald’s The Great Gatsby. In addition, it has been featured in pop culture, including the acclaimed movie, Citizen Kane, and Taylor Swift’s 2014 song Blank Space. Wow, those are some nice places to visit. I will be bookmarking these places so that I can schedule a visit to one of them, especially Oheka Castle, when I’m in the United States.